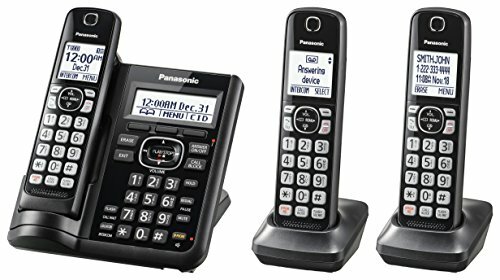 The Panasonic KX-TGF543B expandable DECT 6.0 Phone with answering system, dual keypad and 3 cordless handsets is a smart, reliable home/home office solution designed to make everyday call management easier and more convenient for everyone. Hear who's calling from across the room without having to get up with text-to-speech announcements in English and Spanish from the base unit and cordless handsets in the home/home office. Easy call block, speakerphone, voice paging, power back-up operation, and advanced TAD (telephone answering device) functions tie it all together making this system one of the most reliable and functional systems available in the market today. Enjoy additional conveniences including full duplex speakerphone, power back-up operation, baby monitor, noise reduction, headset jack and more!